Fitbit Won Mindshare on Black Friday, But is That Enough To Brave the Upcoming Apple Watch Storm? Black Friday has come and gone, and consumers have come out of it with countless technological goodies. But which brand won the most mindshare during this crucial retail weekend? According to our Social Media data, Fitbit! 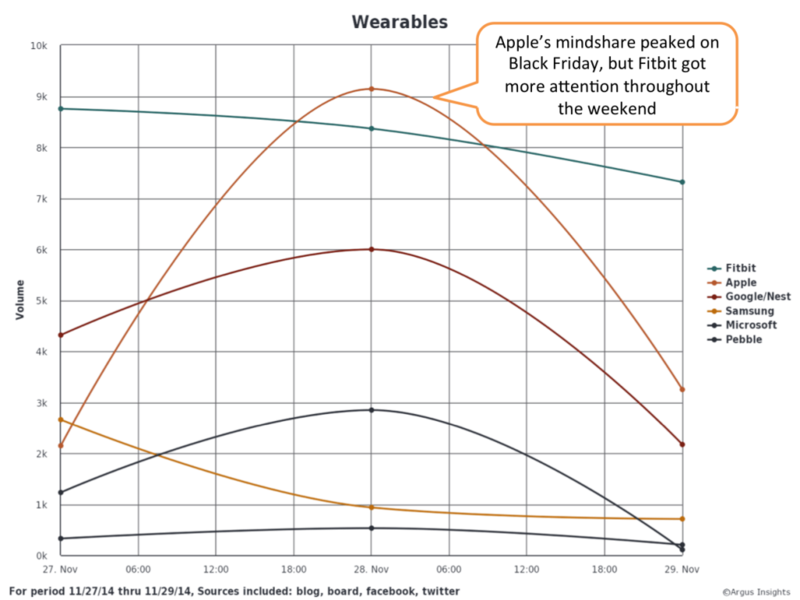 Fitbit saw the most conversation throughout the weekend, while Apple was discussed more on the day of Black Friday. Apple’s buzz boost on Black Friday was primarily the result of conversation about a product that is not even on sale yet…the Apple Watch! Fitbit, on the other hand, generated conversation about fitness trackers that are currently on the market. Consumers discussed their delight derived from successful weight loss endeavors on boards and tweeted eBay deals and product review articles to fellow shoppers. Fitbit’s fitness trackers saw enduring attention throughout the weekend, but Apple did receive the most Black Friday attention on social media. That attention was not related to immediate sales, but it does validate consumer eagerness to get their hands on the Apple Watch. Discussion of Fitbit drove conversation about products available to buy, which could be promising for adoption. Will Fitbit’s Black Friday push ensure success over the upcoming Apple Watch release? Argus Insights will continue to listen to the consumers and keep you updated throughout this wearables war. Sign up to get free weekly insights into the wearables market derived from consumer conversation on social media. At Argus Insights, we are constantly tracking consumer reactions to brands and products across several types of consumer technology, smartphones, appliances, and more! For access to our data, personal consultation, or custom reports, please contact us. If you are interested in a specific market, check out our Consumer Demand Reports for the Smartphones, Wearables, and Home Automation markets.